When I was a kid, one of the best things to come in the mail was the newest HeathKit Catalog. In those days, kids and adults could build their own shortwave radios for almost nothing. I never had the “almost nothing” to spend, but remember spending hours reading, looking, and rereading that catalog—dreaming of the parts it would take to create my own shortwave radio set. I built hundreds in my mind. Between Heathkit electronics’ catalogs and ads that promised squirrel monkeys, alligators, baby chick hatching, and fishing, a poor kid could dream beyond the present. I know that I wasn’t the only one to escape that way—to draw, design, and imagine. While I’m a long way from there now, Raspberry Pi (FAQs) has rejuvenated that desire to dream and build in me—and I’m hoping it will do the same for kids, their parents, and teachers. You can build a computer that works well for almost nothing—$25; you’ll just need to creatively design a case to contain it. Yes, you read that right. 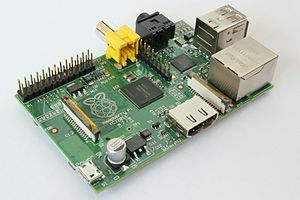 Raspberry Pi is an ARM GNU/Linux computing device for $25. That’s open source, so you have to love it. Build a box for $25 and run free software on it. It has all the connections for peripherals, such as mouse, keyboard and monitor, too. I know that they’re coming out with a camera to hook into an already existing camera slot, too. The camera will cost a few more dollars, but not a lot. This is perfect for building in the garage, living room, computer classroom, or afterschool program. You can’t sit on it, but it certainly makes as much sense to build a computer as it did a stool in woodshop—and I’m thinking more. Heck, build the computer in computer lab or a classroom, and design the case in tech ed/industrial arts/shop class. You decide, but rounding up $25 dollars (Model A) to do it for a lot of students is a no brainer. There is a Model B for $35, and that’s not out of funding range either. Just the thing a PTO or PTA would love to get involved with, and I’m certain other organizations as well. The whole Raspberry Pi concept is the brainchild of Ebon Upton and a crew of British colleagues out of the University of Cambridge’s Computer Laboratory. Their idea was to bring back the excitement of computer science programming by developing a science project that all students could get excited about, take pride in, build themselves, and best of all—really worked. This is not a toy; these are real computing devices. Now, that’s what I call fun! Upton can’t keep up with supply on these, yet, so you may have to order and wait. I think that they’ll figure that part out pretty quickly. It’s amazing the experiments, robotics, and interfaces you can create with these. Some have sent Raspberry Pi units into space, using a balloon, and have recorded, captured, and returned real data. This is amazing stuff. It certainly beats just shooting a model rocket in the air with a parachute. Raspberry Pi is a perfect science classroom fit. Just think of all the possibilities for collaboration—especially if you’re looking for something interdisciplinary. What did you do in school today? Made a computer! If you’re looking for cool, it doesn’t get cooler than this, and the price is kid and school perfect. There’s plenty of FAQs, How To, and even a book to help. And because it’s open source, everyone is figuring out, trying out, and sharing. If I had to pick one thing to put on your back to school list beyond pencils and notebooks, this would be it. Raspberry Pi should be on every opening day faculty meeting agenda, too. Kids will dream, teachers will engage students, and grandparents will remember—we used to build cool stuff that worked—and we can again. Please check Adafruit for more Project Ideas as well as the materials to do them. It is amazing. Plenty of Raspberry Pi stuff there, too, and Arduino as well.